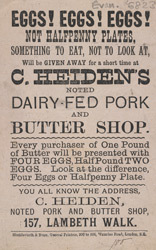 Dairy stores like the one featured in this leaflet bought their milk and dairy produce from farms and depots around the country. Traditionally dairy work was performed by women. Milkmaids worked very hard, milking began at 3 or 4am and each worker had to milk about 12 cows. The cows were often milked in the fields (although in cities the cows were kept in shacks and sheds and so this was less of a problem) and the milk had to be carried to the dairy. Then cheese and butter had to be made and packaged ready to be transported for sale in towns and cities. In the afternoon the cows had to be milked again.